As such, Anglican and Methodist theology holds that "there is an intermediate state between death and the resurrection of the dead, in which the soul does not sleep in unconsciousness, but exists in happiness or misery till the resurrection, when it shall be reunited to the body and receive its final reward." This space, termed Hades, is divided into Paradise (the Bosom of Abraham) and Gehenna "but with an impassable gulf between the two". 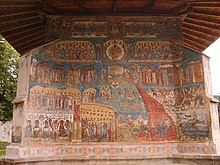 Souls remain in Hades until the Last Judgment and "Christians may also improve in holiness after death during the middle state before the final judgment". Anglican and Methodist theology holds that at the time of the Last Day, "Jesus will return and that He will 'judge both the quick and the dead'," and "all [will] be bodily resurrected and stand before Christ as our Judge. After the Judgment, the Righteous will go to their eternal reward in Heaven and the Accursed will depart to Hell (see Matthew 25 KJV)." The "issue of this judgment shall be a permanent separation of the evil and the good, the righteous and the wicked" (see The Sheep and the Goats). Moreover, in "the final judgment every one of our thoughts, words, and deeds will be known and judged" and individuals will be justified on the basis of their faith in Jesus, although "our works will not escape God's examination." 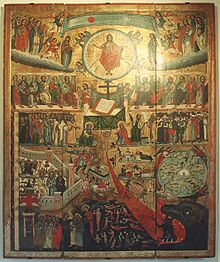 The Eastern Orthodox Church teaches that there are two judgments: the first, or "Particular" Judgment, is that experienced by each individual at the time of his or her death, at which time God will decide where the soul is to spend the time until the Second Coming of Christ (see Hades in Christianity). This judgment is generally believed to occur on the fortieth day after death. The second, "General" or "Final" Judgment will occur after the Second Coming. Although in modern times some have attempted to introduce the concept of soul sleep into Orthodox thought about life after death, it has never been a part of traditional Orthodox teaching, and it even contradicts the Orthodox understanding of the intercession of the Saints. He Who will shine resplendent in the Day of Resurrection is the inner reality enshrined in the Point of the Bayan. which referred to Baha'u'llah being the inner reality of The Bab. The 'Point of the Bayan' refers to The Bab Himself. Moreover, The Bab foretold the coming 'Him Whom God shall manifest', which Bahais believe is Baha'u'llah. Furthermore, Baha'u'llah wrote in the Kitab-i-Aqdas: "Whoso layeth claim to Revelation direct from God, ere the expiration of a full thousand years, such a man is assuredly a lying imposter." The thousand years is calculated from beginning in October 1852 CE and they could refer to either lunar or solar years, which correlate to roughly the Islamic New Year of 2269 AH or October 2852 CE. In summary, it could be that 1) Baha'u'llah is the inner reality of The Bab and 2) The Maiden is the inner reality of Baha'u'llah. Therefore, that 3) One Who comes in the Station of The Maiden will be the next Rasul after the 'full thousand years'. Additionally, The Maiden spoke of Baha'u'llah: "By God! This is the Best-Beloved of the worlds, and yet ye comprehend not. This is the beauty of God amongst you, and the power of His sovereignty within you, could ye but understand." Similarly, Baha'u'llah wrote about the previous prediction of His own Revelation from God in the Epistle to the Son of the Wolf: "The Commander of the Faithful (Imám ‘Alí)—peace be upon him—moreover, saith in the Khutbiy-i-Tutúnjíyyih: “Anticipate ye the Revelation of Him Who conversed with Moses from the Burning Bush on Sinai.”"
↑ Schwarz, John E. (১৯৯৯)। The Compact Guide to the Christian Faith। Bethany House Publishers। আইএসবিএন 9780764222702। Most churches — Catholic, Protestant and Orthodox — are amillennial. ↑ Holden, George (১৮৫৫)। The Anglican Catechist: Manual of Instruction Preparatory to Confirmation। London: Joseph Masters। পৃষ্ঠা 40। We are further taught by it that there is an intermediate state between death and the resurrection, in which the soul does not sleep in unconsciousness, but exists in happiness or misery till the resurrection, when it shall be reunited to the body and receive its final reward. ↑ Swartz, Alan (২০ এপ্রিল ২০০৯)। United Methodists and the Last Days। Hermeneutic। Wesley believed that when we die we will go to an Intermediate State (Paradise for the Righteous and Hades for the Accursed). We will remain there until the Day of Judgment when we will all be bodily resurrected and stand before Christ as our Judge. After the Judgment, the Righteous will go to their eternal reward in Heaven and the Accursed will depart to Hell (see Matthew 25). ↑ Withington, John Swann (১৮৭৮)। The United Methodist Free Churches' Magazine। London: Thomas Newton। পৃষ্ঠা 685। The country is called Hades. That portion of it which is occupied by the good is called Paradise, and that province which is occupied by the wicked is called Gehenna. ↑ Shields, Charles (২০০৯-০৫-০১)। Philosophia Ultima। Applewood Books। পৃষ্ঠা 184। আইএসবিএন 9781429019644। Some Anglican divines, from like premises, have surmised that Christians may also improve in holiness after death during the middle state before the final judgment. ↑ ক খ Campbell, Ted A. (১ ডিসেম্বর ২০১১)। Methodist Doctrine: The Essentials। Abingdon Press। পৃষ্ঠা 78। আইএসবিএন 9781426713644। The third Article of Religion affirms that Christ "ascended into heaven, and there sitteth until he return to judge all men at the last day." This statement is consistent with the Apostles' Creed ("from thence he shall come to judge the quick and the dead") and the Nicene Creed ("He will come again in glory to judge the living and the dead"). In the end, Christ will be our judge. Wesley's Sermons maintain that at the final judgment every one of our thoughts, words, and deeds will be known and judged. Our justification on "the last day" will again be by faith in Christ but our works will not escape God's examination. ↑ Swartz, Alan (২০ এপ্রিল ২০০৯)। United Methodists and the Last Days। Hermeneutic। ১১ এপ্রিল ২০১২ তারিখে মূল থেকে আর্কাইভ করা। সংগ্রহের তারিখ ২৬ ফেব্রুয়ারি ২০১৭। Wesley believed that when we die we will go to an Intermediate State (Paradise for the Righteous and Hades for the Accursed). We will remain there until the Day of Judgment when we will all be bodily resurrected and stand before Christ as our Judge. After the Judgment, the Righteous will go to their eternal reward in Heaven and the Accursed will depart to Hell (see Matthew 25). ↑ Ritchie, Arthur (১৮৮৮)। "Six Sermons to Men Preached in St. Ignatius' Church New York City During Lent, 1888"। American Bank Note Co.। সংগ্রহের তারিখ ২৯ সেপ্টেম্বর ২০১৫। The teaching of the Bible concerning the General Judgment at the end of the world presupposes a particular judgment of each soul at the hour of death, for the king at that last judgment shall separate the righteous from the wicked "as a shepherd divideth his sheep from the goats." ↑ Olliffe, Matt (২৩ সেপ্টেম্বর ২০০৫)। "What will happen on Judgement Day? "। Sydney Anglican Network। সংগ্রহের তারিখ ৩০ সেপ্টেম্বর ২০১৫। Our decisions matter. Our throw away lines. Our thoughts and motives. They all have eternal meaning.